Danny Heitman of The Baton Rouge Advocate doesn't think there's been much, uh, truck between poetry and automobility in recent years, but we here at Poetry & Popular Culture disagree, and #'s 3-10 of the Top 10 Roadside Rhymes show why. (Just scroll down to find 'em all.) For #2 on that list, we go all the way to the Rock Creek Lodge in Clinton, Montana. There, the folks of Big Sky don't just make up triple rhymes (a pair of dactyls at that!) but they've got, well, the balls to use that rhyme as the name of their annual Mardi-Gras-like event held in celebration of the Rocky Mountain Oyster—the Testicle Festival. Now, before you turn away in disgust—either at the thought of ingesting a bull's family jewels, or because you think P&PC's got nothing more in the way of cultural taste than Beavis and Butthead—it's important to remember that bawdy rhymes and body parts (or is it body rhymes and bawdy parts?) are always more complex than they first appear. Mikhail Bakhtin would have agreed with us, but it's not necessary to bring in a Russian Formalist's analysis of European social events to tell us about American bull. 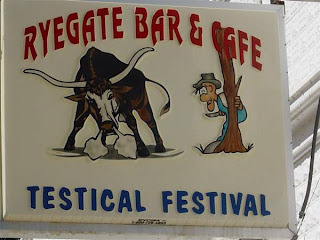 The Testicle Festival is, in fact, a modern-day commemoration of the "rendezvous system" of fur trading—a way of exchanging goods that replaced trading posts in the American West around 1825. Rather than hanging out a shingle year-round, fur trappers and their agents and assigns agreed to meet once a year to do their business and buy supplies all at the same time. 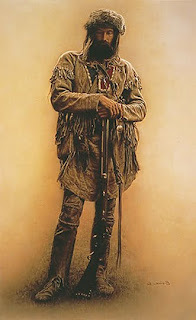 "The typical rendezvous," Carlos Arnaldo Schwantes writes in The Pacific Northwest: An Interpretive History, "was a combination fair, circus, and rodeo with opportunity for feasting, drinking, carousing, and contests of skill." That's still pretty much the case at Rock Creek, except that these days—or so a quick look at the 18-and-over portions of the Test Fest's web site reveals—there are different sets of assets put on display. Intrigued about the derring-do of the triple rhyme—to say nothing of the cajones it took to erect such a stunning pair of dactyls on a sign along I-90—P&PC caught up with event organizer Matt Powers. Here's that conversation. P&PC: Um, how's it hangin'? Matt Powers: With a bit of a swing. P&PC: How did Rock Creek come up with the Festival's rhyming name? MP: When trying to come up with a party based in Rocky Mountain Oysters, Testy Festy just flowed, so it was used. P&PC: What were the other options? MP: There really weren't any. It was the first thing we thought of. P&PC: Are there any poetry events held at the Test Fest? MP: There are not, but this year a limerick competition would be a great addition to the contests we hold. P&PC: You'd have to keep an eye out for dangling modifiers, I suppose. Have a sample limerick for us—or a first line? P&PC: I hear a lot of bikers attend. What sort of poetry do bikers like? MP: A lot of bikers attend, but bikers over the last 15 years are not lumped into the same box. You get some bikers that are high school dropouts, who probably don't like any poetry other than music, and some who have Doctorates, who would probably enjoy all forms. That's a question that is best posed to the masses. Sorry. MP: It's a well rounded party ... Yuppies, bikers, rednecks, cowboys, fans of Dorothy... Really a true mix. P&PC: Well I guess I should say "have a ball," right?